Enclosure: Corn snakes must be housed in at least a 20 gallon tank. The tank must have a secure top. A determined snake can push against screen or glass until it finds an opening big enough for its head; where its head goes, so goes its body. Some snakes will constantly rub their nose against the screened top of the tank in an effort to find a way out. The resulting abrasions should be treated with an antiseptic and antibiotic ointment. The furnishings in the enclosure should then be evaluated to provide a more natural environment. Provide a Hiding Place A hide box of some sort should be provided, and an interesting branch for climbing and resting. Branches collected from the wild will need to be debugged by soaking first in chlorine/water solution, then rinsed thoroughly, soaked in clean water, then left to dry in the sun. No special lighting is required. With corn snakes, there are 3 really good substrates that can be used, such as pine chips (not cedar chips, are toxic), indoor/outdoor carpeting and "Astroturf" and Pet-shoppers favourite back-to-nature animal bedding which is •Biodegradable. If you use the carpeting or Astroturf, you must wash it then let it dry thoroughly before it can be used in the tank again; have two pieces on hand which can be rotated. The snakes will often burrow under the chips or carpet/turf, so dont be surprised if they are not always in view. If you use pine or aspen shavings or cypress mulch, the urine and feces can be scooped out with a cat litter scoop, with fresh chips added as needed. Be sure to remove soiled substrate as soon as possible; urine-soaked material become a breeding ground for bacteria and fungus. If you use this type of substrate you will have to place your snake in a secure area to feed it; you do not want it to ingest any chips. Temperature An undertank heat pad is placed under one-half of the tank; this leaves one side cooler so that your snake can regulate its body temperature as needed. A heating pad made for people can be purchased at any drug store; set it at medium or low depending upon the ambient air temperature. To maintain health, corn snakes must be kept at 75-85 F, the higher temperature being necessary to digest its food. Temperatures can fall to the lower range at night. To easily monitor temperature, inexpensive aquarium self-stick thermometers can be purchased and applied about an inch above the bottom of the tank on the warm side. 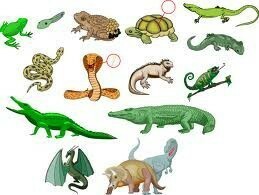 Hot rocks should never be used; they fluctuate too much, and too many reptiles suffer severe ventral burns. An incandescent light bulb in a reflector shield may be set just outside the tank to heat up a basking area; appliance timers can be set to turn the light on and off at set times during the day. Reset the hours of operation to adjust for seasonal fluctuations in ambient air temperature. An active snake will happily eat every 7 to 10 days or so. They will eat, and should only be fed, killed prey. A snake who is not hungry when live prey is introduced into the enclosure often finds itself becoming the meal, especially if the prey is a rat. To economize, you can buy in bulk and freeze them. Remove the prey item from the freezer and allow to defrost at room temperature. When defrosted, use forceps or tongs to pick up the rodent by the tail, and hold the prey in front of the snake for the snake to strike at. Many snakes will eat prey that is just placed in the tank. Occasionally, a quail egg can be offered to wild-caught specimens. If the snake likes it, one can be offered every couple of weeks. (Since quail eggs purchased in stores or from hatcheries are unlikely to be fertilized, they should not form a regular part of the main diet.) Start hatchlings off with pinkie mice. 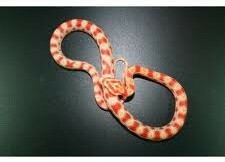 As your snake grows, gradually increase the prey size by offering fuzzies, crews, then small adult mice or rat pinkies. A full-grown Corn or Rat can eat a medium to large mouse; large Rat snakes can eat small rats. If you feed too much at one feeding session, or feed a prey item that is too large, your snake may regurgitate it. Water A bowl of fresh water must always be available at all times. It will be used for drinking and sometimes for bathing. If the snake defecates in it, the bowl must be cleaned and disinfected immediately. Corn snakes do not wrap snugly around your arm like pythons or kings. They tend to pick a direction and go for it. Though they are relatively small in body mass, they are quite strong. Always support the body and give free rein to the head. If the head starts going somewhere you dont want it to go, gently guide it into another direction. Many snakes are nervous when introduced into a new situation with new people. Give them a couple of days to settle down before letting new people handle them. As a Corn Snake grows, its old skin become too tight and worn. A new skin awaits just below the old. As a snake gets ready to shed, its eyes will turn a milky blue over the course of several days, and the body color will start to dull and develop a whitish sheen. Once the eyes have cleared, the snake is ready to shed. To assure proper hydration, soak the snake in warmish water after the eyes clear; this should enable to snake to shed easily within the next 24 hours.